Beginning in Fall 2015, GrowNYC will partner with Green Beetz to deliver the organization’s holistic food-based curriculum to over 300 elementary school students city-wide. GrowNYC will distribute and support teachers in implementing Green Beetz’s health-based curriculum to 10 elementary schools over the course of a one-year pilot in collaboration with Grow to Learn. Read the full press release. Green Beetz’ mission is to empower middle schoolers to navigate the complex issues surrounding food in the 21st century. Green Beetz' innovative, holistic curriculum incorporates media and inquiry-based activities, inviting students to consider how food impacts the environment, their bodies and the world around them. The Green Beetz curriculum was developed in collaboration with The New York Academy of Sciences to ensure its alignment with age-appropriate STEM topics and Common Core State Standards. Since the non-profit’s founding in 2013 by Dr. Anna Chapman, Andrew Chapman and Tracey Kemble, the organization has worked in East and Central Harlem to test its holistic model. Included in today’s announcement is the release of “Captain Trash Bag,” a Green Beetz original video promoting the curriculum. Thanks to funding from Empire State Development, GrowNYC is hosting a rotating cast of New York State brewers and distillers paired with a local restaurant at our Union Square and Grand Army Plaza Greenmarkets every Saturday until November 21. Each week shoppers will have the opportunity to sample and purchase beer and spirits made of local ingredients, taste market-fresh dishes that complement the craft beverages on offer and purchase regionally grown flours, wheat berries, pastas, and dried beans from our Greenmarket Regional Grains Project. Over the past five years, the Northeast has seen a resurgence of interest in small grain production coinciding with innovative grain based product development in the food and beverage sectors. Consumer demand for local foods along with policy initiatives such as Governor Cuomo’s Farm Brewery and Farm Distillery legislation, and the work of Greenmarket’s Regional Grains Project have helped fuel the grain renaissance in New York State. GrowNYC is thrilled to provide a marketplace for these innovative craft brewers and distillers to introduce their New York State products to Greenmarket shoppers. 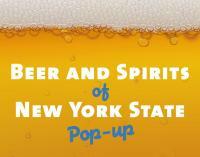 Check the Beer & Spirits of New York Pop-up webpage for updates on each week's participants. In particular, the craft beverage industry has seen dramatic and unprecedented growth. Since 2011, the number of farm distilleries in New York State has increased 450 percent, from 10 in 2011 to 55 today. The number of craft breweries alone has more than doubled from 2012 to 2015, from 95 breweries in 2012 to 207 in January, 2015. GrowNYC was at the forefront of this surge when we partnered with Brooklyn Brewery to help source the ingredients to create a truly local beer. In 2013, Greenmarket Wheat was born and today it is one of Brooklyn Brewery's perrenial brews and is made with 70% local ingredients including NY State wheat, hops, barley and honey. The Beer and Spirits of New York Pop-up stand received funding through Empire State Development’s Craft Beverage Marketing and Promotion Grant Program, in coordination with the New York State Department of Agriculture and Markets. The program was created to increase the profile, awareness and sales of New York State produced wine, beer, spirits, and hard cider, and provides matching funds for the marketing and promotion of craft beverages. The Craft Beverage Marketing and Promotion Grant Program is administered in alignment with the Governor’s Taste NY initiative, and Taste NY branding will be used throughout the pop-up stand. This Spring and summer GrowNYC completed several new rainwater harvesting projects and updated several existing ones. At Governors Island Teaching Garden, we installed 3 systems from a child sized shade structure that collects into 2 - 5 gallon containers and allows children to open and close valves which divert the flow of water either to the containers, a see through hose or a drain to the adjacent rain garden. To collect rainfall from the adjacent former Coast Guard housing, a 500 gallon tank was installed to collect from a large area of roof and two 50 gallon barrels collect from a smaller roof area. A flow meter was installed on the 500 gallon tank to monitor water usage. These installations were completed using funding provided by the NYS Pollution Prevention Institute through a grant from the NYS Department of Environmental Conservation. 6,000 visitors have interacted with the Green Infrastructure projects on Governors Island this season. At the Brook Park Community Garden in the Bronx, GrowNYC worked on a week long effort with community gardeners and volunteers from In Good Company to install 3 new rainwater systems. A 1000 gallon cistern captures rainfall from the downspout of an adjacent home, a 250 gallon tank collects from an existing shed and 2 - 50 gallon barrels store water captured from a chicken coop. GrowNYC staff worked with 10 youth aged 14 to 18 from Brotherhood Sister Soul in West Harlem to repair an existing rainwater system and install a new system in the Frank White Garden. Each system has 100 gallon storage and collects from existing shade structures in the garden. The youth learned about the New York City combined sewer system as well as getting hands on building experience developing pollution prevention solutions. GrowNYC staff completed a shade structure in the Morning Glory Garden in the Bronx which collects rainwater into a 300 gallon tank. A new 300 gallon tank was installed at the Greenspace on Fourth Garden in Brooklyn. This new garden on land atop a water tunnel access site is a native plant garden where the gardeners installed a rain garden in collaboration with Brooklyn GreenBridge . The overflow from the rainwater system is diverted to the rain garden. A 1000 gallon rainwater system at the St. John Cantius Garden in East New York, Brooklyn was reconnected to the adjacent building after it had been disconnected due to a change of ownership of the building. These new and reconnected systems now bring the total number of rainwater harvesting systems in New York City Community Gardens to over 140 systems with the capacity to collect more than 1.5 million gallons of rainfall per year. An interactive map of these gardens and all rainwater harvesting sites can be found here.